"You don't need a campfire for this s'mores-inspired dessert. 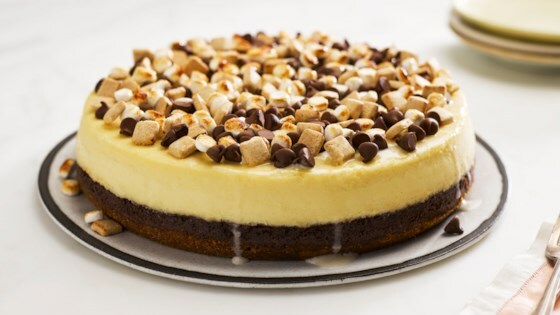 S'mores Baking Pieces and rich cheesecake rest atop a bed of brownies." Heat oven to 350 degrees F. Grease sides of 9-inch springform pan. Wrap outside of pan with foil, extending foil at least 2 inches up pan sides. CRUMB CRUST: Heat oven to 350 degrees F. Stir together 1 cup graham cracker crumbs and 2 tablespoons sugar; blend in 1/4 cup (1/2 stick) melted butter or margarine, mixing well. Press mixture onto bottom and 1/2 inch up side of 9-inch springform pan. Bake 8 to 10 minutes. Cool. BROWNIE LAYER: Stir together 6 tablespoons melted butter or margarine, 1-1/4 cups sugar and 1 teaspoon vanilla extract. Add 2 eggs, stirring until blended. Stir in 1 cup plus 2 tablespoons all-purpose flour, 1/3 cup HERSHEY'S Cocoa, 1/2 teaspoon baking powder and 1/2 teaspoon salt; blend well. Spread in prepared pan. Bake 25 to 30 minutes or until brownie begins to pull away from side of pan. Meanwhile make cheesecake batter. CHEESECAKE: Beat cream cheese, sugar and vanilla in large bowl until smooth. Add eggs, one at a time, beating well after each addition. Immediately after removing brownie layer from oven, spoon cheesecake mixture over brownie. Place cheesecake in water bath* and return to oven. Continue baking 45 to 50 minutes or until center is set. Remove from water bath to wire rack. With knife, loosen cake from side of pan. Cool to room temperature. Remove side of pan. Set aside 2 tablespoons marshmallows and 1/4 cup chocolate chips from s'mores baking pieces. Place reserved 2 tablespoons marshmallows and 1 tablespoon cream in small microwave-safe bowl. Microwave at MEDIUM (50%) 10 seconds; stir. If necessary, microwave at MEDIUM an additional 5 seconds at a time, stirring after each heating, until marshmallows are melted and mixture is smooth. Spread over top of cheesecake. Sprinkle remaining s'mores mixture over top; press lightly into marshmallow mixture. Place reserved 1/4 cup chocolate chips and remaining 2 tablespoons cream in small microwave-safe bowl. Melt following the same procedure used for the marshmallows. Drizzle over top of cheesecake. Cover; chill about 2 hours or until ready to serve. (As cheesecake sits the marshmallows and graham pieces will become softer.) Refrigerate leftover cheesecake. The chocolate base of this cheesecake we did not like.